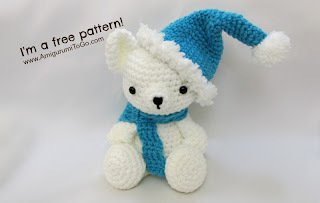 This pattern is for the hat and the scarf that will fit the Bears in this pattern. 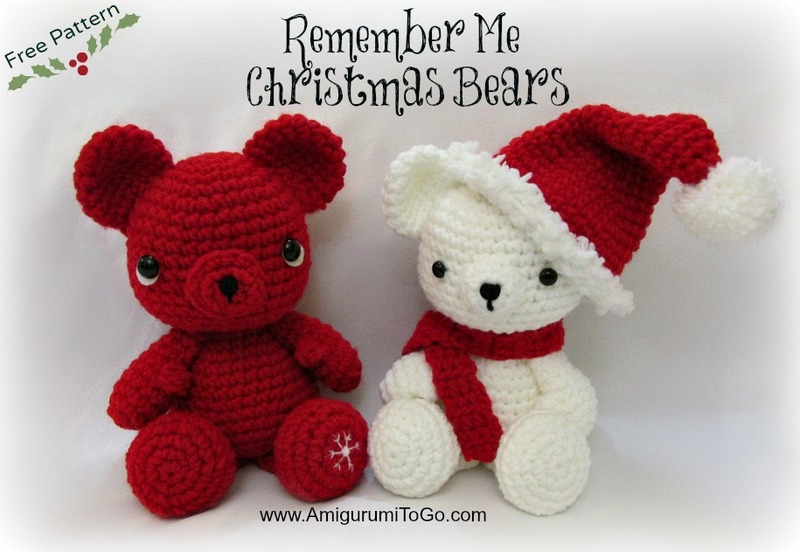 The only difference is these Christmas Bears were made with Red Heart Super Saver yarn and a 4.0 mm (G) hook. Please note: that there are no written instructions for the snowflake on the red bear's foot. I used embroidery thread to do it. I looked for the easiest snowflake image online that I could find and did my best to make it look like that image. It was all trial and error. I have included some tips on how to embroider an initial in the video tutorial. And you can always leave off the snowflake, it's optional. Read me ~> Work in continuous rounds, do not join. If you crochet more on the loose side then use a smaller hook so you don't get gaps and stuffing showing through the stitches. Add in a marker at the end of row 2 and move that marker at the end of every row. I just use a short length of yarn and pull it through the last stitch I put in at the end of every row. I used Bernat On the Fringe Yarn in White for the trim but you can use whatever you'd like to use. There's lots of yarn used for trim that you can choose from. 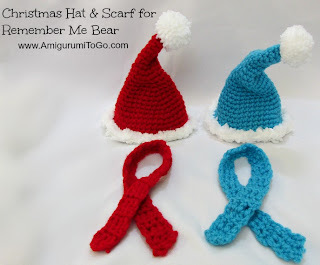 *In the video I make the pom pom first then I attach it to the hat at about row 8.
sl st next st and f/o. Weave in the yarn tail or work it into the next round ** please see the video for the optional way to trim the hat if you would prefer to use regular yarn instead of the fancy yarn. Please refer to this pattern for written instructions on how to make a pom pom. You can make the pom pom any size you like. I show how to make the pom pom in the video tutorial as well. You can add on fringe. Refer to my Christmas Mice pattern here for written instructions on how to do that or view the video instructions if needed. I believe your Dendrite (snowflake) is very well done! 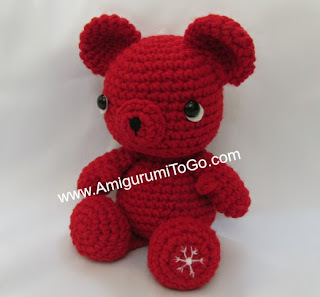 I think I would put one on the front of the bear or the ends of the scarf, just to see what it looks like....I love the foot though. Small, and just adds more cuteness to it. But yours has just enough that it is wonderful and adorable. Had a ball making these little guys! Grands will love them? Thanks for the vedieo.